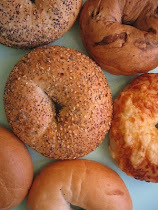 Always fresh and toasted to order, you'll find our bagels light, fluffy, and delicious. Over time, we've selected five varieties our customers have come to love: everything, sesame, plain, cinnamon raisin, and asiago cheese. We'll dress them up with a firm steak tomato slice and a cream cheese of your choice: plain, smoked salmon, sun-dried tomato, roasted pepper, chive, garlic, and strawberry. And if you have a sweet tooth, try one of our own favorites, a bagel with peanut butter or butter & jam!